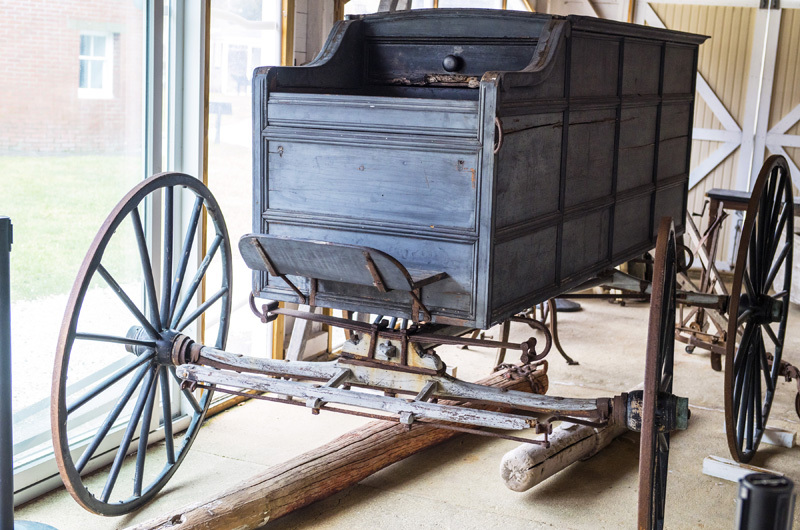 Undertaker's wagon was donated to the town in the 1800s. As Edgartown voters turn to business from funding for schools to harbor repairs next week at town meeting, they will also be asked to restore pieces of the past. One artifact in particular represents a long-ago act of charity. The Martha’s Vineyard Museum is asking for $39,250 to restore a 19th-century undertaker’s wagon owned by the museum. The old wagon is in disrepair, with peeling paint and wheels that don’t roll properly. In the early 1800s the wagon was used to transport the town’s dead, Martha’s Vineyard Museum curator Bonnie Stacy said. It was primarily used on Chappaquiddick. “It was an act of kindness by the woman who donated it,” she said. Because of the wagon’s age there are few records, Ms. Stacy said, and the museum has relied on the lore that surrounds it. An article published in 1933 indicated the wagon was still used occasionally, she said. It was later found in a barn and donated again, this time to the museum. You have got to be joking? $39,250 to restore that box? Not with my tax dollars. I'm used to getting gouged for goods and services here but this one beats them all so far. Hopefully is a mis-print and you mean $3925.00. Is it too much to ask to send it up to the high school and let the woodworking class do the job? For free? This fascinating undertaker's wagon was kept safe for decades in what was called "The Old Barn" (differentiated from "The Big Barn, said to be the largest on MV) on Tom's Neck Farm on Chappaquiddick. For many years there was a dessicated cat (skin, fur and whiskers - poor thing had probably eaten a poisoned rat and the poison not only killed it but also all the bacteria that would have caused it decompose!) and a human skull in the back of the wagon. My children used to delight in taking their unsuspecting friends, flashlights in hand, out to the barn under cover of dark, where they would throw open the rear doors illuminating these spooky items . I don't need to describe the responses! The wagon was given to the Museum by my grandmother thus returning it to the care of the Town. It is a treasure that needs to be preserved!